Today, September 3, 2017, a broadly unified raza-led front of elders, high school and college students, barrio youth, political radicals, muralists, artists, cultural workers, academics, activists, native people of the Kumeyaay nation, labor organizers, religious people, etc. 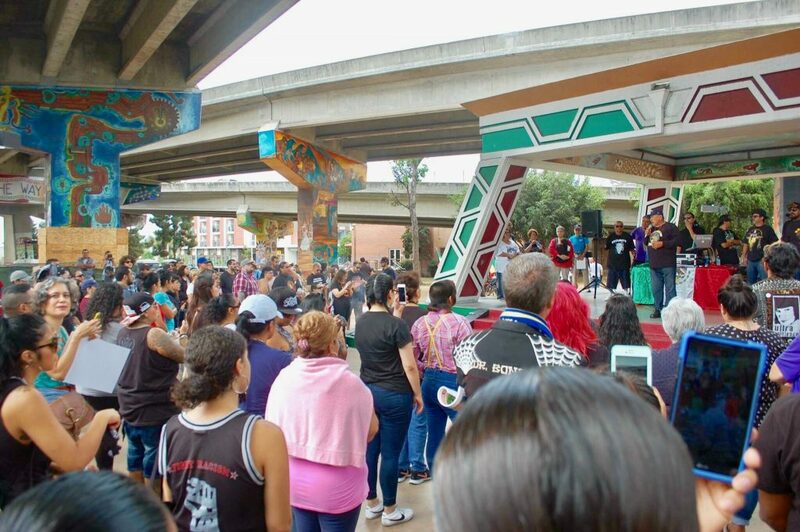 unconditionally joined forces with at least 500 local community people to defend Barrio Logan’s historic Chicano Park. Click here to see a video about the history of Chicano Park. This important demonstration act of community self-defense came together as a response to a series of online threats that had been made against the park. During the second week of August a San Diego based group of anti-Mexican Trumpista provocateurs posted a series of videos and comments declaring that Chicano Park and our murals offended their patriotism and that those of us that protect Chicano Park are anti-American, anti-Trump, and anti-White in general. They also included a call to “scope-out” the Park on Sunday, and for their supporters to gather inside the Park at 1:00 pm. Their original call to show up in the park did not actually make any direct threats, but within the posts shared by their supporters there were dozens of direct and extremely violent threats made against the Park and against the community of Barrio Logan. Of course Chicano Park has been the focus of this kind of negative attention ever since it was first taken over on April 22, 1970, so the online threats that started in August were nothing new. What was different this time is that the threats were coming in the wake of the August 12th killing of Heather Heyer in Virginia, when a neo-Nazi decided to run his car through a crowd of protestors. 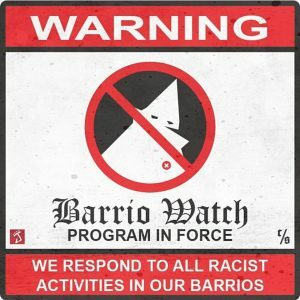 Because the violence in Virginia originated with a neo-Nazi parade in defense of a confederate monument, right-wing Trumpista groups in San Diego felt that they could draw attention to themselves by calling for the elimination of Chicano Park, because as far as they are concerned, our Park is more offensive than Nazism, the confederacy, and white supremacy. Furthermore, during previous weeks there has been an intensification of Trump’s anti-raza policies through a rapid increase in ICE detentions, the August 25th presidential pardon of Joe Arpaio, the August 31st announcement that the prototypes of Trump’s wall are coming to San Diego, and the ongoing threats of the imminent cancellation of DACA. 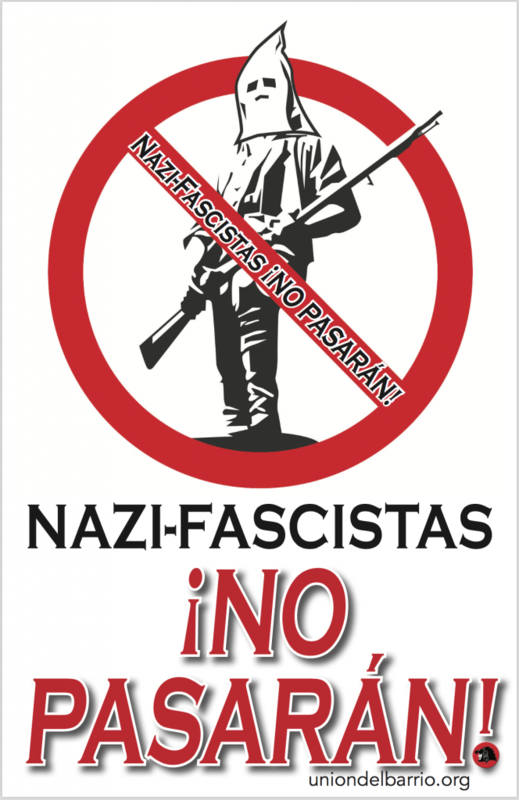 Finally, we still carry fresh in our memories they May 26, 2016 threats made by San Diego and Orange County skinheads to force their way into Chicano Park to hold a rally there to celebrate Trump’s visit to the San Diego Convention Center. The threats against Chicano Park quickly went viral among the so-called “alt-right.” The threats also went viral among progressive circles, and spread well beyond San Diego. What had started out as a message to “stay trucha” quickly became a major event. As Unión del Barrio it was not until Friday afternoon that we collectively decided that we could not stand down in the face of this now viral threat. It was at that point that we put out our public call to rally at the park, and reached out to coordinate with, and submit to the leading role of the Chicano Park Steering Committee (CPSC). It is essential that all of us who identify as defenders of Chicano Park recognize the leading role of the CPSC as still made up of many elders who originally led the fight to take over the Park, and who now work every day as stewards of the Park. 1- The right wing Trumpista fascist groups have Chicano Park in their crosshairs. We are 100% sure that they will continue to threaten the Park, the murals, and statue of General Zapata. We also know that there were many of them that were walking among us today, and they were running a well-developed counter-intelligence operation on us. They collected video, followed around people they believe are in leadership positions, and they watched us closely to measure how organized we are. 2- The hundreds of us that showed up to defend the Park today had incredibly strong hearts, but we are in no way anywhere near as organized as we have to be in order to stop these reactionaries from attacking our communities. We have no other option to getting better organized now, because when the inevitable future threats come the only way we will be able to defend the Park and our community is by being more organized and responding with disciplined resistance. This entry was posted in 2017, Analysis, Barrio Youth News & Events, Border Related News & Events, Cultural News & Events, Event, History, Organizational Updates, Police & Migra, San Diego News & Events, Self-Determination, Solidarity, Statement. Bookmark the permalink.